With summer’s high temperatures and humidity comes an array of beautiful tropical blooms. Tropical blooms tend to be bright in colour and quite differently textured to many traditional garden blooms so they provide great contrast in your plantings or vase work. The Zingiberaceae family is incredibly diverse, including approximately 1300 species. Ginger falls into one of two categories; cooking ginger, or ornamental ginger. The common ginger, Zingiber Officinale, as well as Cardamom (Elettaria cardamomum), Tumeric (Curcuma longa) and Galangal all form part of this family of plants; ingredients often featured in exotic Asian style cooking. Gingers are some of the most stunning flowers we have in our garden, and each species is entirely unique and special. 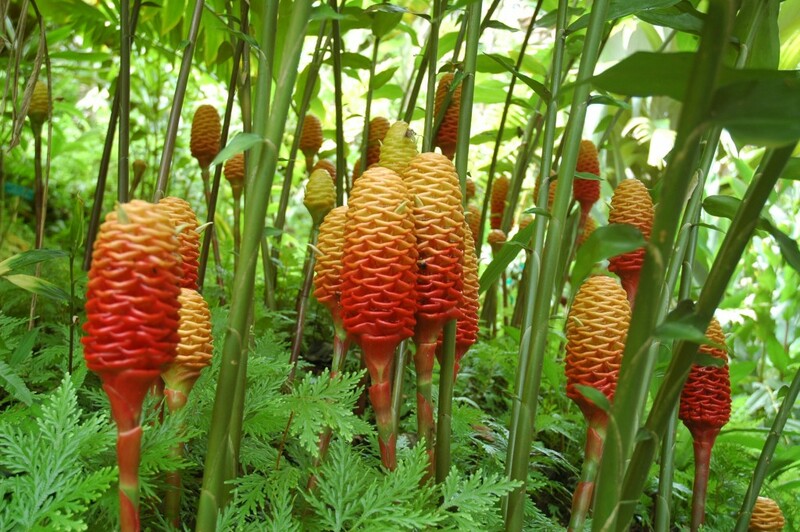 Like some other tropical plants such as Heliconias, the Ginger is a rhizome. 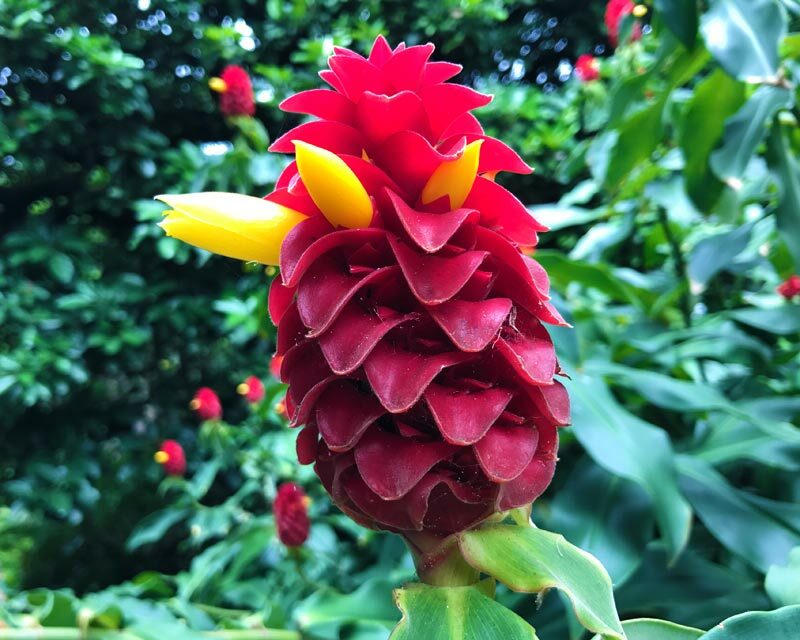 Flowering gingers are closely related to the common ginger however belong to a different genera including but not limited to Alpinia, Globba, Zingiber and Curcuma. 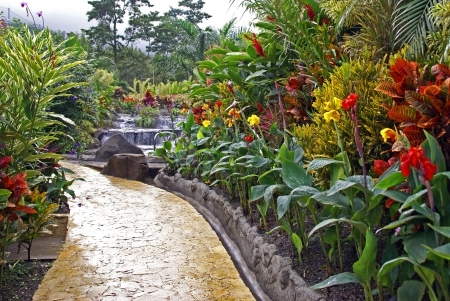 Gingers are the perfect plant choice if you are trying to create a lush, tropical garden space with Asian influences. Many gingers are evergreen, although some varieties lose their leaves in winter. 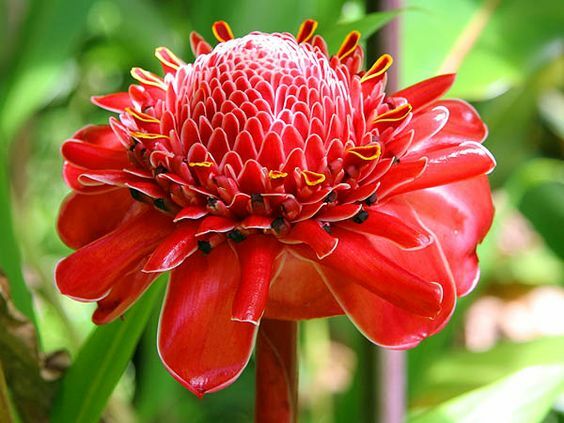 The Beehive ginger, Zingiber spectabile is often found in florists. They have stunning rounded heads with a waxy surface, and are covered with a series of pockets which form a hive-like texture. They are available in yellow, peach and chocolate tones. Beehive gingers are a great focal flower, and are incredibly long lasting. Dancing Lady Gingers, Globba winitii, are one of my absolute favourites. Dancing Lady Gingers favour a sheltered position in a garden, so are suited to positions where they can sit under the canopy of other plants. There flower cascades naturally, so are ideal for using in bridal bouquets. They are long lasting and available in an array of colours. 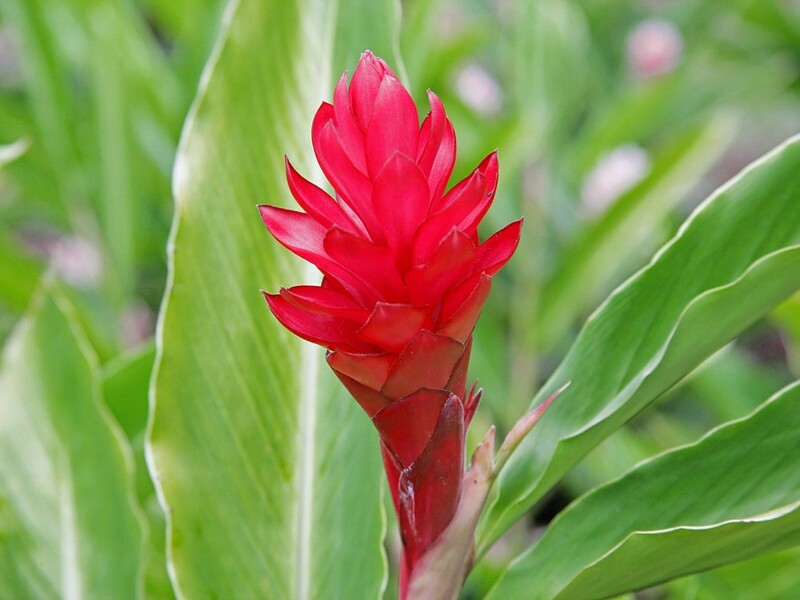 Red Ginger, Alpinia purpurea is also commonly used in the floristry world. The have a stunning pink – red bloom, and are a long lasting cut flower. As a plant, they can grow up to 2m with lots of lush foliage. 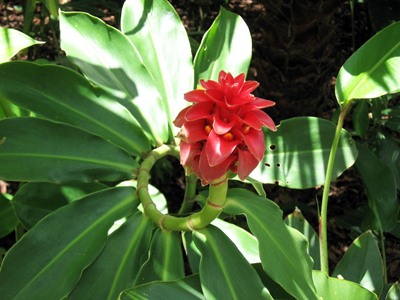 Lipstick Ginger, Costus barbatus are also known as Spiral Gingers. The bright red bracts are small and pine cone like, with small yellow flowers that ‘pop’ outwardly. 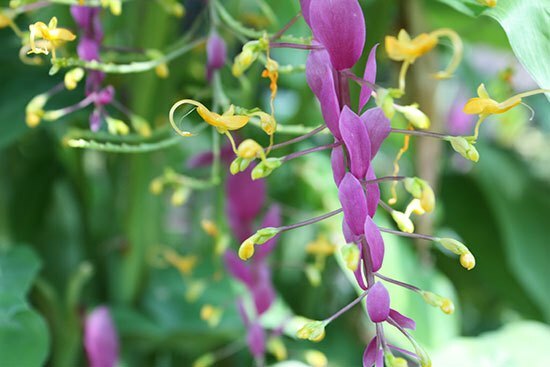 The stems corkscrew beneath lush foliage hence the name ‘Spiral Ginger’. 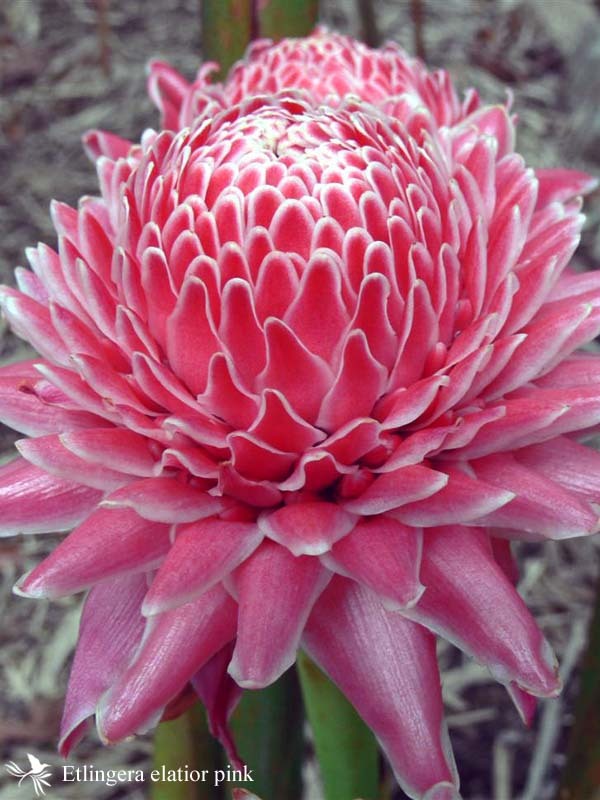 Torch Gingers, Etlingera elatior are available in white, pink and red. They have a similar appearance to a Waratah in the size, shape and colour of their bloom, but they differ in that their overall texture appears to be waxy. Siam Tulips, Curcuma alismatifolia, are also known as the Jewel of Thailand or Hidden Gingers as they have large displays of foliage that can cover the blooms. They are available in pink, mauve and white tones. There are approximately 80 species of Curcuma, with some available in yellow, golden and orange tones, as well as varieties with verigated foliage. Enjoy your choice of Ginger blooms while they are at their best. You will find that choosing tropical blooms for your vases during summer makes sense- they grow in the heat, and therefore last in the heat too, so you get better value for money!